Apple has released iOS 12 beta 9 and macOS Mojave beta 8 to users enrolled in the developer beta testing programs. Typically a developer beta version is released first and is soon followed by a public beta release that matches the same build, even if the versioning number is behind. iOS 12 Developer beta 9 has a build of 16A5362a. Separately, new beta builds of watchOS 5 and tvOS 12 are also available to users beta testing software on their Apple Watch and/or Apple TV. 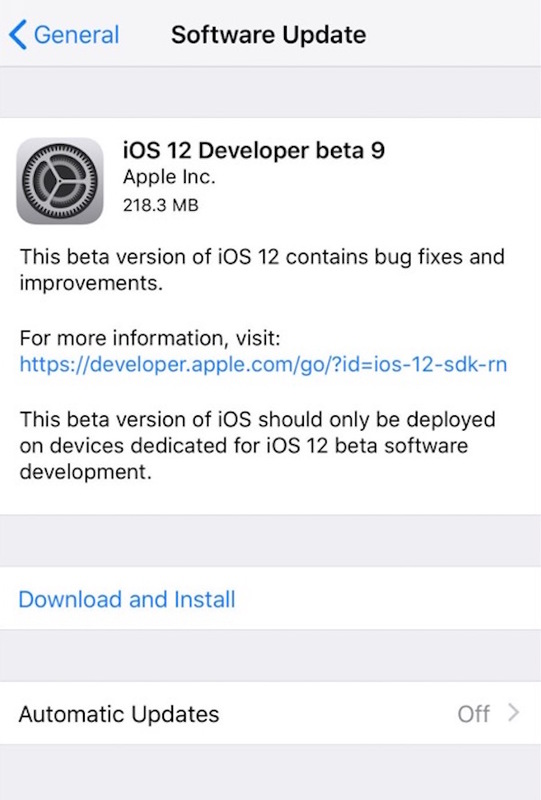 iOS 12 developer beta 9 is available to download now on devices running a prior dev beta build by going to Settings > General > Software Update. Likewise, the same version labeled as iOS 12 public beta 7 is also available to download. macOS Mojave developer beta 8 is available to download from the Software Update control panel found in System Preferences (macOS Mojave has moved the operating software update mechanism back into System Preferences and away from Mac App Store). The public beta version of macOS Mojave public beta 7 is also available to download. Technically anyone can install developer beta system software if you can come across the installer or profiles, but there is little reason to do so when a public beta is ongoing. Users interested in running beta system software can install iOS 12 public beta or install macOS Mojave public beta onto compatible hardware. Note that beta system software is notoriously less reliable than a final version, and thus it’s critical to backup your devices and important data before attempting to do so. iOS 12 is said to focus on performance enhancements and improvements to iOS, but also includes new features like a Memoji cartoon avatar creation feature, new Animoji icons, a Screen Time capability that allows you to track app usage and set time limits, and other refinements and adjustments to the iOS operating system. macOS Mojave includes an all new Dark Mode theme, desktops that change dynamically throughout the day, various refinements and improvements to the Finder, the inclusion of a variety of iOS apps on the Mac like Voice Memos and Stocks, and other adjustments and improvements to the Mac operating system. Apple has said that both macOS Mojave and iOS 12 will be released in the fall, along with the latest versions of watchOS and tvOS. The public beta is available for anyone to download, sign up at apple public beta website.